© Sunrise Greetings. All rights reserved. With patience, wisdom, and love, you rule. Sunrise Greetings was founded 1974. Three liberal arts graduates saw a market for contemporary social expression products and began printing their own cards in a small garage in the college town of Bloomington, Indiana. 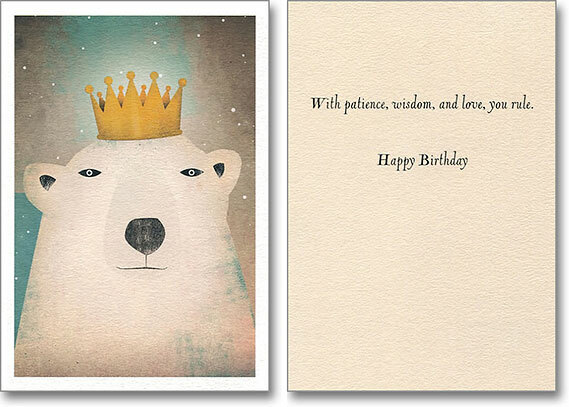 The company quickly established a reputation as a purveyor of greeting cards featuring unique, high-quality imagery from a diverse set of illustrators. Today Sunrise continues to offer cards with appealing artwork and just the right message to help nurture relationships with family and friends. Environment: Produced on paper with recycled fiber or paper stock from sustainable forests.